So, when Edie and I were invited to Lazer M.A.D.’s launch event at Bunker 51 in London, not only did I immediately know it would be an amazing opportunity to hone said pathetic sounds effects (you’ve got my number Lucas Films), but it would also be amazing fun… so we obviously jumped at the chance. 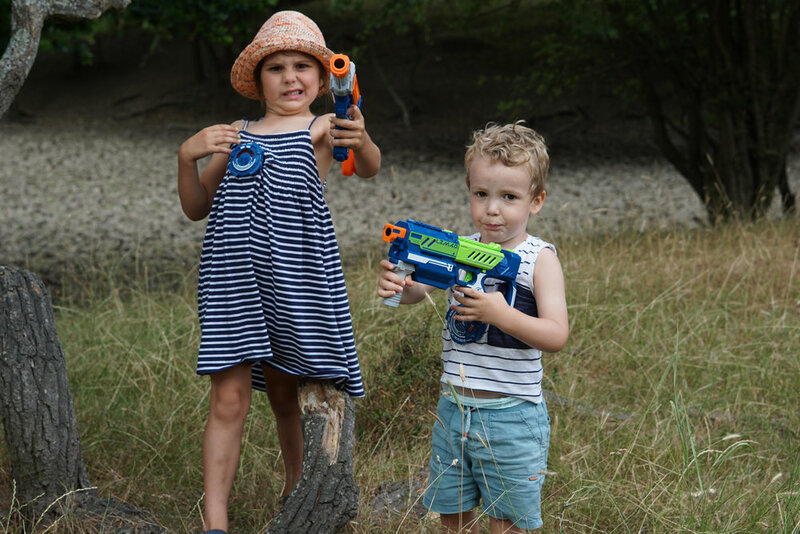 Edie and I arrived in South East London, dressed ready for combat; t-shirt, shorts and trainers – my camouflaged army gear might have been a little OTT against a bunch of primary-aged kids. We were then guided by our Squadron Leader (let’s call her Lucy, because that was her name) into the Mission Control Room before we were advised to boost our energy with supplies (squash and crisps) before being briefed on our dangerous assignments. Briefing over and it was time to get kitted up. Blasters ready, we moved into the bunker area; a dark, damp space littered with barriers, hide-outs and an old truck, perfect for Edie and me to pick off unsuspecting waist high foes. As the games went on, we both grew in confidence, Edie especially as she launched repeated kamikaze missions into the enemy’s base (it was either confidence or just sheer madness). We played for two hours and during that time it was great to see Edie’s face light up with sheer joy - am I raising the next Rambo? I’m guessing not, but I’m definitely raising a young girl who loves to try new things, mix it with the boys and older children, and throw everything she has at challenges. Brilliantly, we were gifted a blaster set from Mookie Toys to review and take home after the event, so my pathetic ‘pew pews’ can finally be replaced by something more realistic. GIVEAWAY! You can win a Lazer M.A.D. Advance Battle Ops set (worth £59.99) by heading over to my Instagram and entering the competition there.